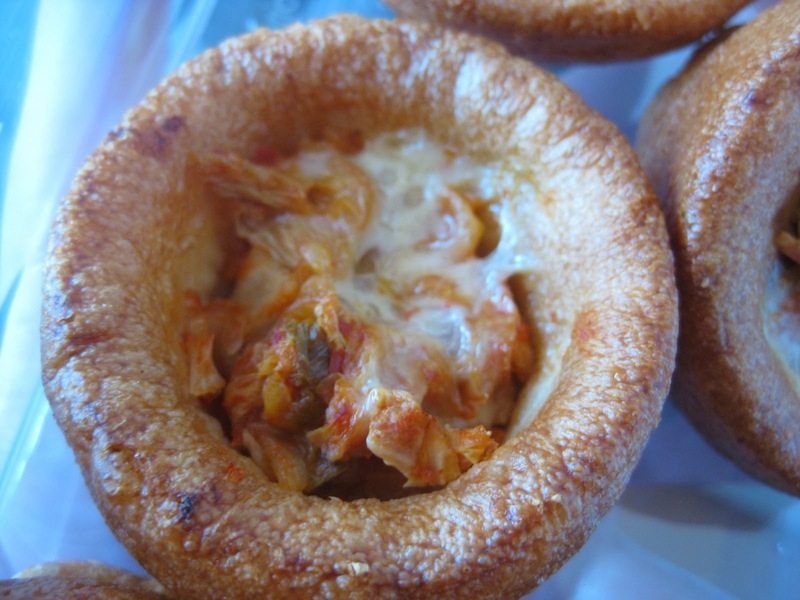 Bacon wrapped kimchi and kimchi Yorkshire puddings. For some Christmas parties recently I made two dishes - kimchi wrapped in bacon; and kimchi in Yorkshire puddings for the vegetarians. 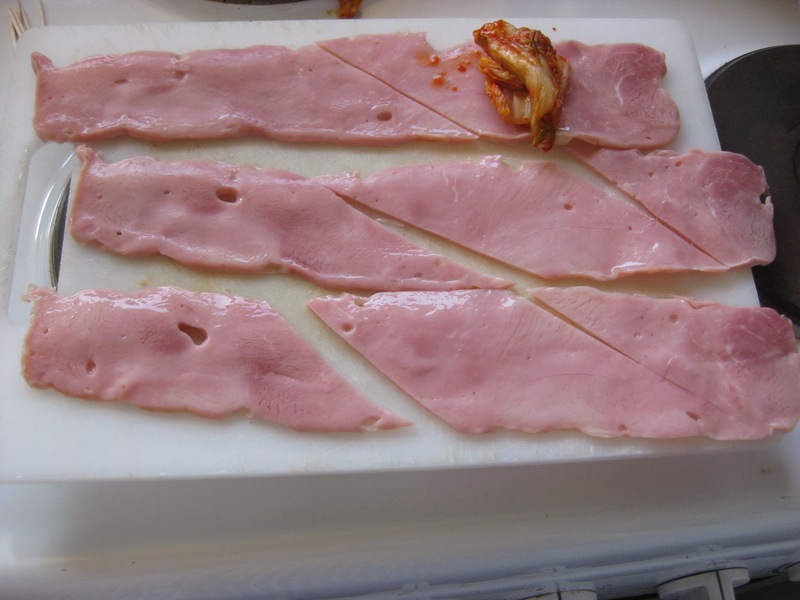 It's a relatively simple dish to make, just bacon (rasher is probably best - I tried picnic bacon, but it wasn't as flavoursome as I was hoping for) and kimchi. 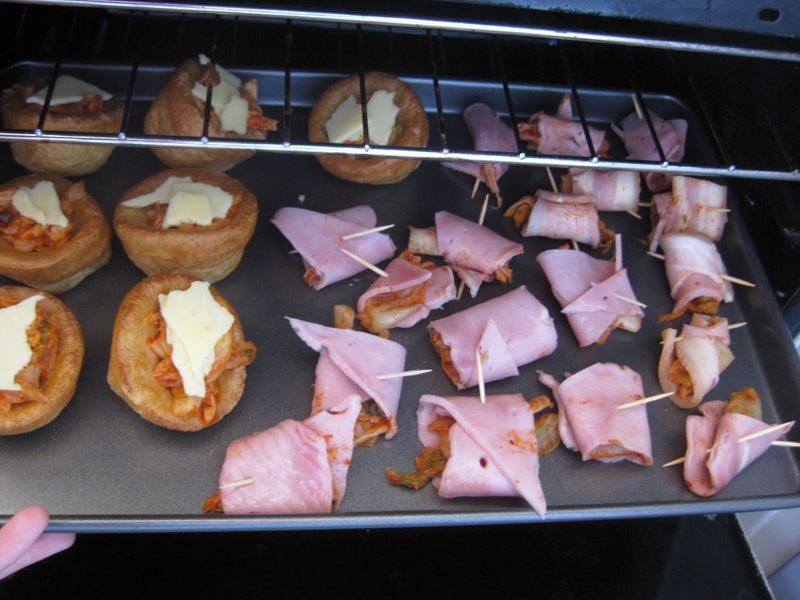 You'll also need some toothpicks (the round variety of course) to be able to keep the wrap together while you bake it. 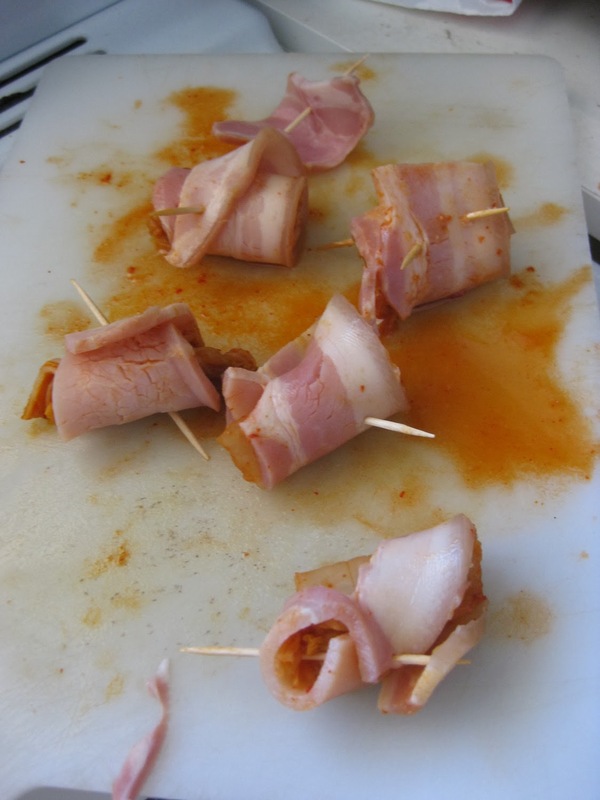 Once baked, it should stay in that shape as the bacon becomes crispy. Cut the bacon into segments about 3 cm wide and long enough that you can wrap all the way around the kimchi, leaving about a quarter of the wrap around again (for integrity). 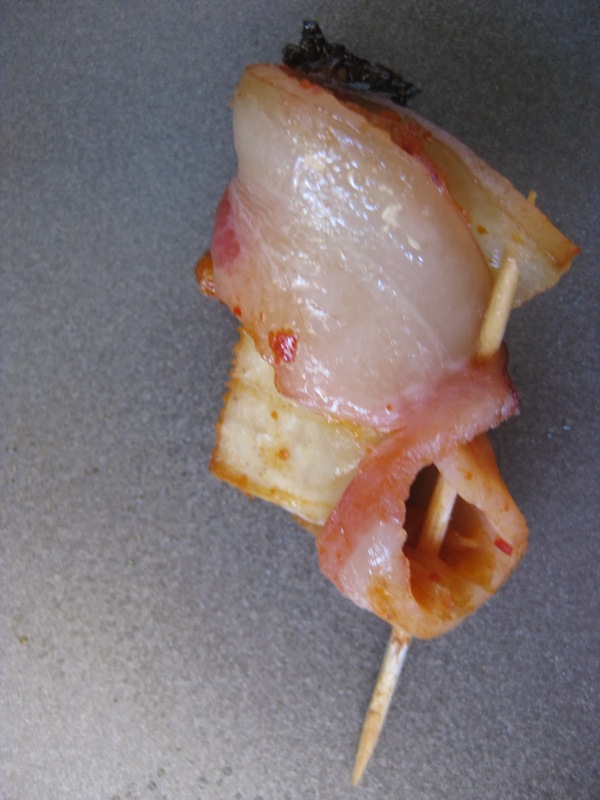 I've found it better to poke the toothpick diagonally through the wrap, otherwise the bacon just unfolds. Bake them in the oven. I used the technique from The Bacon Method - 20 minutes from cold at 190 degrees C.
I left them in the toothpicks for everyone to take out as they wished. I made these for the vegetarians or even people who don't like bacon. 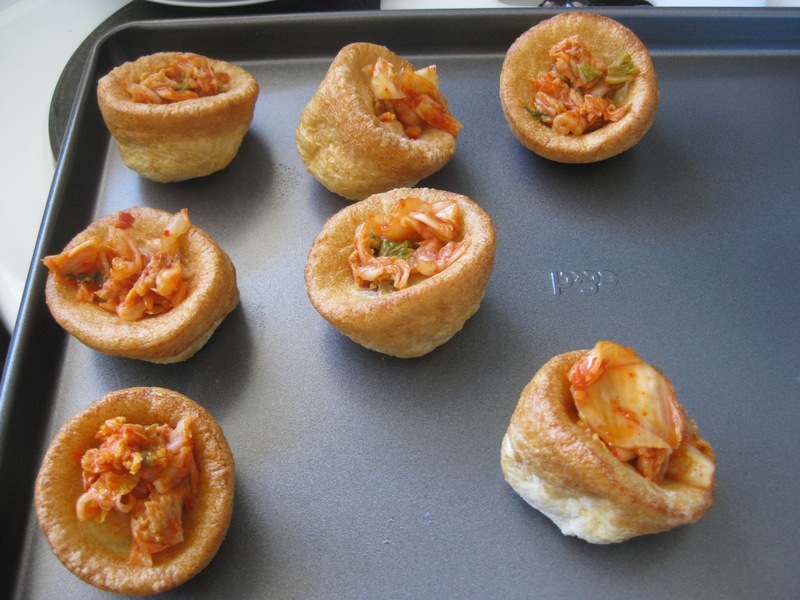 I used frozen Yorkshire Puddings, chopped kimchi of course, and cheese. 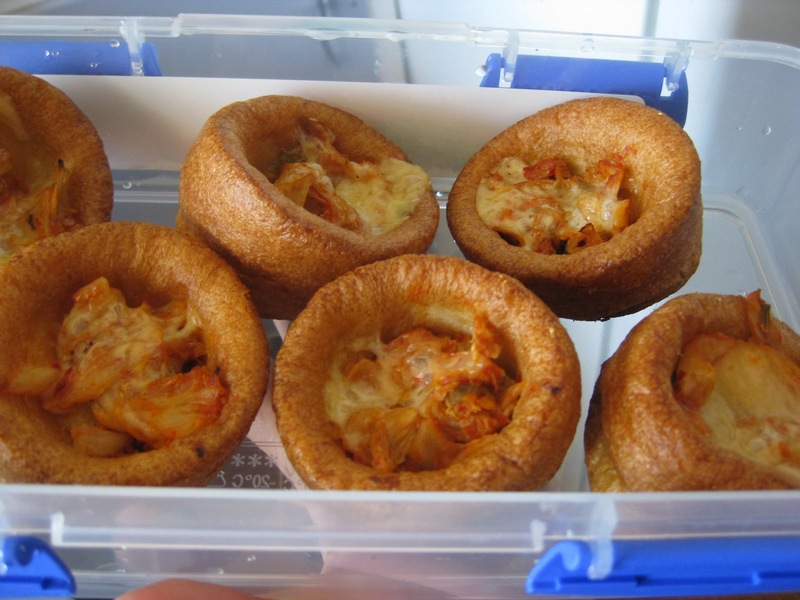 I used these Yorkshire Puddings from the supermarket, but any should work. 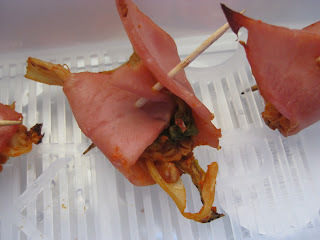 Place the chopped up kimchi into (or is it on to?) the puddings. You might need to be selective about which ones you use - I found that some of them weren't very bowl-like so didn't hold much. Place the cheese bits on top. Just randomly break them up if that's easier, or you can use grated cheese. After a few minutes they'll be done in the oven. 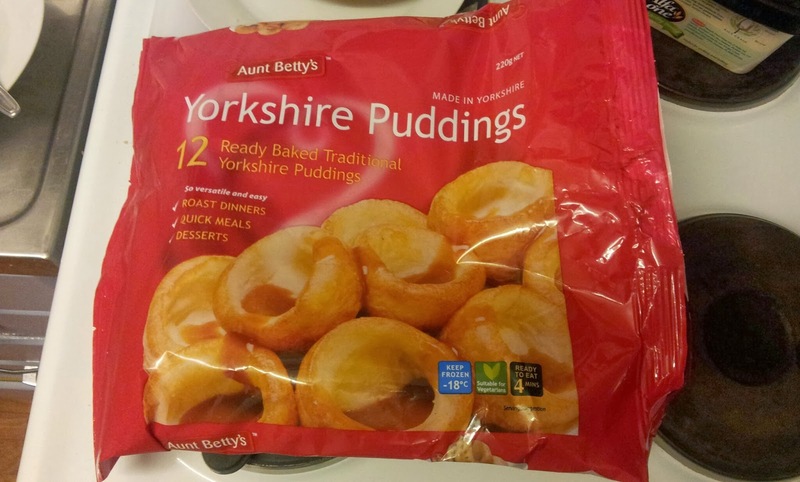 Follow the instructions on your particular packet of Yorkshire Puddings though - mine said 4 minutes. If you wanted to, you could of course add chopped bacon or mozzarella cheese would be nice too. If you decide to add bacon, you'd want to cook the bacon separately first otherwise the puddings might burn. If you try it, let me know in the comments of your ideas! !